They can live in both freshwater and salt lakes. It is also known as fartet, its Spanish common name. 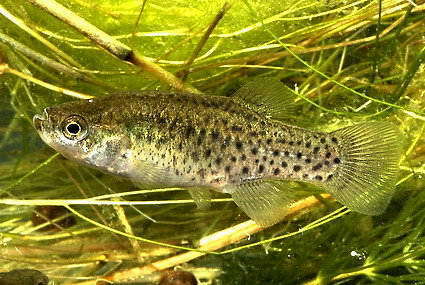 Aphanius iberus is a small, stocky fish, rarely exceeding 5 cm in length. The head is relatively large, the mouth is small and protractile, and the jaws have tricuspid teeth. Sexual dimorphism is notable and permanent. Both the body and the tail fin in males are crossed with vertical silver stripes. Females are larger than males and their body is covered with numerous small dark spots that form vertical short lines. 10% of the sale price of this neckwarmer is donated to the environmental NGO GEPEC. For further information about the work carried out by GEPEC, take a look to this page. 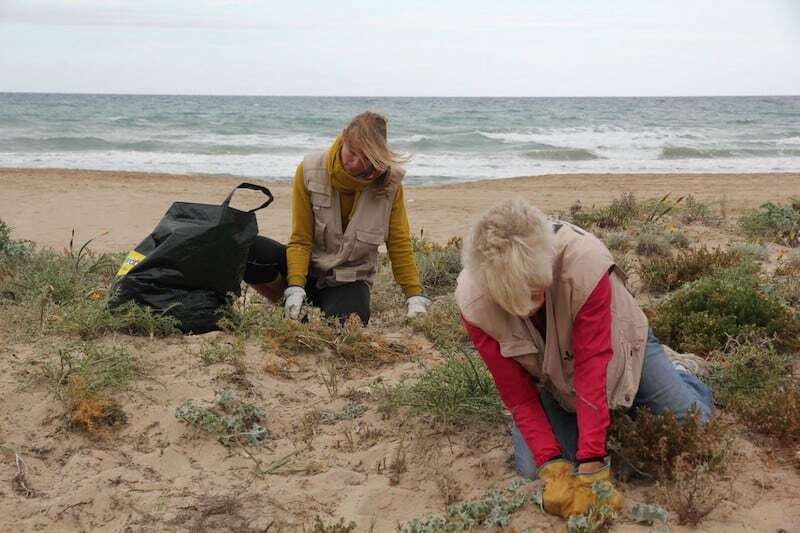 Recently, the Atlantic coastline populations of Andalusia are being considered as a distinct species to those of the Mediterranean. This new species has been given the name of Aphanius baeticus. It is distinct from Aphanius iberus due to its isolation in the drying up of the Mediterranean Sea some 5,000 million years ago. Spanish Toothcarps are restricted to the Mediterranean Coast of Spain. They can be found from Aiguamolls de l’Empordà (Girona) to Albufera de Adra (Almería). The extinction of Aphanius iberus in the populations of Southern France has been confirmed. However, they were considered by some as introductions. Spanish Toothcarps live in ponds, coastal lagoons, salt lakes, river mouths, and freshwater beds. 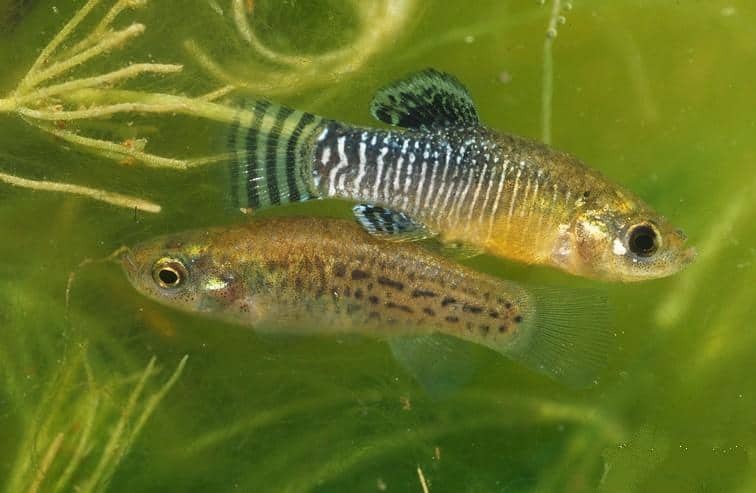 However, their natural habitat appears to have moved due to competition with the mosquitofish (an introduced exotic species). 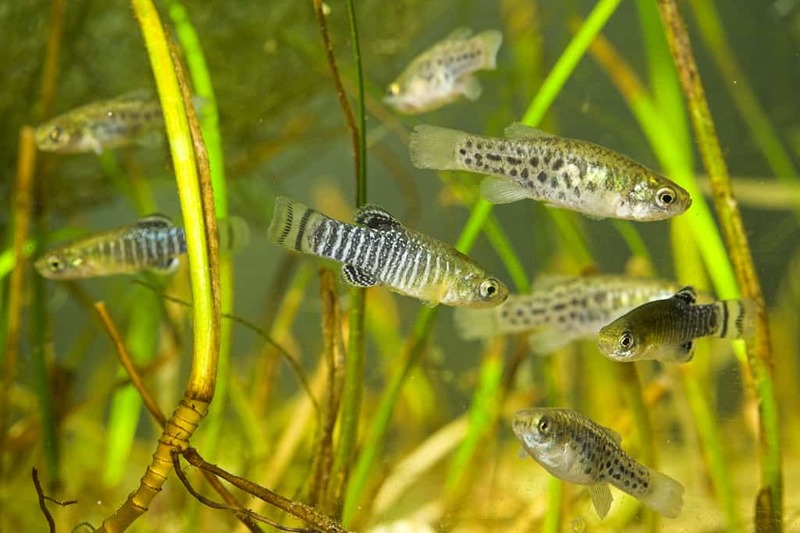 They are now more commonly found in extremely salty areas, where the mosquitofish is unable to survive. In fact, Aphanius iberus has the capacity to adapt to extreme environmental conditions, and can resist wide salinity and temperature ranges. 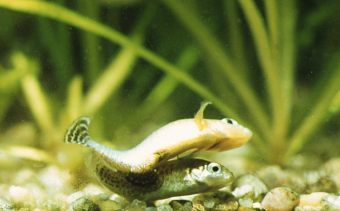 Spanish Toothcarps reach sexual maturity after just 2-3 months and display an intense reproductive effort. Thus, they compensate their short life expectancy, as the majority do not live longer than 1 year. The breeding season extends from April until September, depending mainly on the water temperature. Males turn darker, so silver stripes become more visible. The abdominal and chest areas take on a yellow tone. They also become especially territorial. The large abdomen displayed by the female during the mating season is an irresistible draw for males. The male positions himself above the female and pushes against her with the purpose of leading the female to the bottom. Once there, the male presses against her abdomen to encourage the spawning and immediately impregnates the eggs. From April to September females produce multiple batches of 10 to 30 eggs. They are capable of laying up to 900 eggs per breeding season. The eggs remain either attached to the bottom or above the vegetation as a result of their sticky coating, and hatch after about a couple of weeks. The young are born into a small sac providing all the necessary nutrients for the first days of life. Spanish Toothcarps are voracious throughout spring and summer, spending most of the day looking for food. However, when night falls, they remain quiet at the bottom or within the vegetation. Their metabolism slows down considerably in winter with the drop in water temperature. Spanish Toothcarps are omnivorous, feeding on small aquatic crustaceans, worms, mosquito larvae, molluscs, phytoplankton, debris, and algae. However, their diet can vary greatly according to the habitat. Other fish as well as aquatic birds are the natural enemies of Aphanius iberus. Lifespan in the wild: The majority do not live longer than 1 year. They have a maximum lifespan of 3 years. Average lifespan in captivity: 6 years. Aphanius iberus faces a high risk of extinction in the wild in the near future. It is estimated that the Spanish Toothcarp population has declined by at least 50% in the past 10 years. The area of occupancy, being less than 500 km2, is fragmented and in decline due to pollution and habitat destruction. Sub-populations are disappearing rapidly. With numbers continuing to decrease, its threatened status shows no signs of improving. Habitat destruction and loss because of intensive agriculture and tourism. Drought as well as wetland drainage for urban and agricultural purposes. Water pollution due to agricultural, industrial, and urban spills. 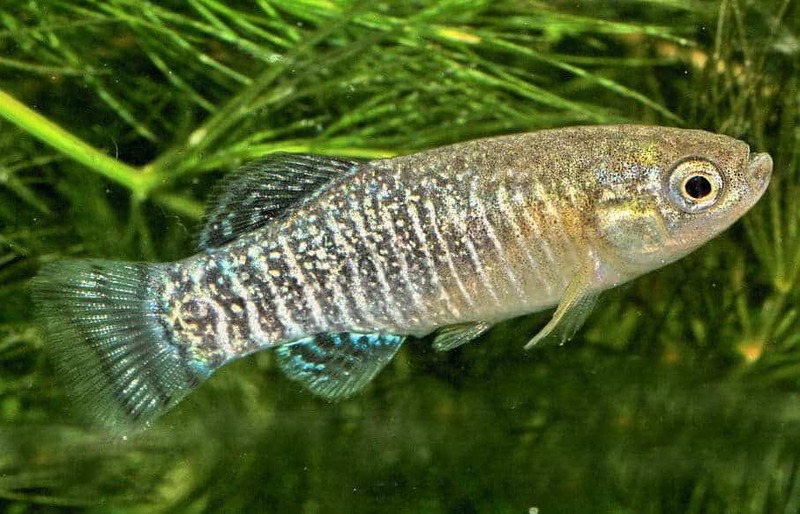 Introduction of exotic fish species, like the mosquitofish. Although reintroduction programmes using captive stock could help this species to recover, these threats will still be present. Evaluated by IUCN Red List of Threatened Species as Endangered (2006). They can live in both fresh and salt water with 57% salinity and up to 32 ºC. Many females die after mating due to the effort of spawning. This species is much appreciated by aquarium hobbyists. However, it can only be held for scientific purposes or with a special authorisation. The common Spanish name fartet refers to its chubby abdomen, as fart means stuffed in Catalan.